Don’t let snoring and daytime sleepiness ruin your life. We can provide you with a tailor-made Sleepwell™ mouth piece which is worn at night and holds the lower jaw forward by as little as 2-3mm. This ensures the airways are free from soft tissue and therefore stops the snoring. In order for us to tailor make the ™ mouth piece you will need to have impressions taken of your teeth. Anti-wrinkle injection of purified form of Botulinum toxin type A. It is technically a ‘poison’ but in real terms the doses are not concentrated enough for it to be poisonous. It is used therapeutically in significantly lower doses than those required to elicit the effects of a poison and is used in the treatment of dynamic wrinkles of the upper face. Treatment with anti-wrinkle injections prevents the release of a chemical from the nerve endings at the treatment area, resulting in these nerve endings being unable to ‘send a message’ to the facial muscle telling it to contract (chemical denervation). Over use of the facial expression muscles often results in deep frown lines, forehead lines and crows feet. An extremely small dose is injected into specific areas which will temporarily immobilise these hyperactive muscles. The aim is to break the habit of frowning and to educate the client in his/her facial movements so they ‘forget’ how to frown. The initial effects become visible in 2-3 days and the results last for 4-6 months depending on the individual. Contact us for a consultation appointment. You will be invited to a free pre-treatment consultation to ensure that you understand the treatment objectives, expectations and results. Dermal filler is a substance which is injected into the dermal layer of the skin to smooth lines and wrinkles and restore contours to the face. Juvederm™ injectable fillers complement anti-wrinkle injections beautifully. Together they allow the treatment of lines and wrinkles over the entire face. As we age our skin loses moisture and the firmness gradually disappears. While anti-wrinkle injections are used to treat the dynamic wrinkles of the upper face, fillers replace the volume that time has taken away resulting in a natural, fresher and more youthful appearance. 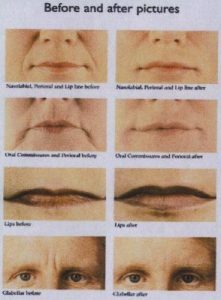 Injectable fillers are used to treat fine to deep wrinkles, frown lines, smile lines, nasolabial folds and scars. They restore the facial contours of the cheeks and chin and give the mouth a fuller form, achieving a long lasting and natural enhancement.